Yeah! 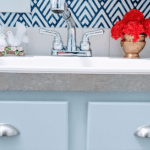 Finally, guys, your wait is over and here you are going to see a huge difference in a small laundry room makeover on a limited budget. 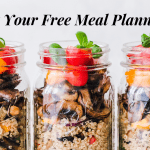 As you have already seen, all the do-it-yourself steps have been performed to provide you resources in the previous posts. Now is the time to show you the whole room and I am not gonna lie to you, it looks fabulous! Yes, absolutely fabulous! Just like “magazine worthy”, or Pinterest worthy! 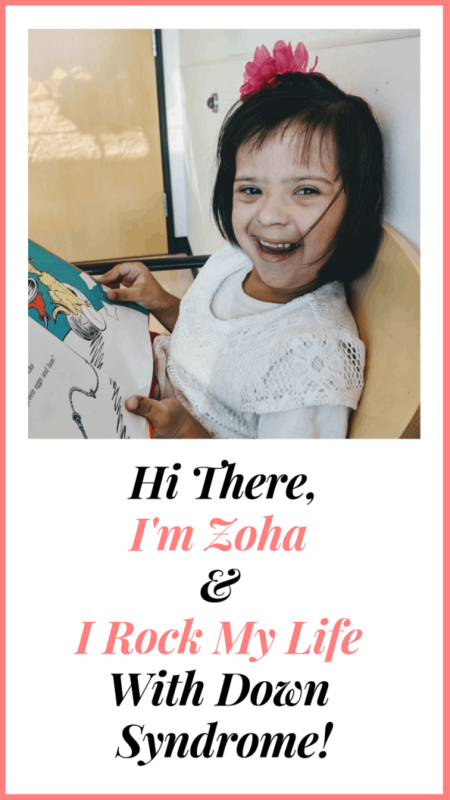 So, are you ready to see the whole process and budget breakdown? I know you are, as some of you have been asking me on Facebook. Let’s dive deep into this makeover. 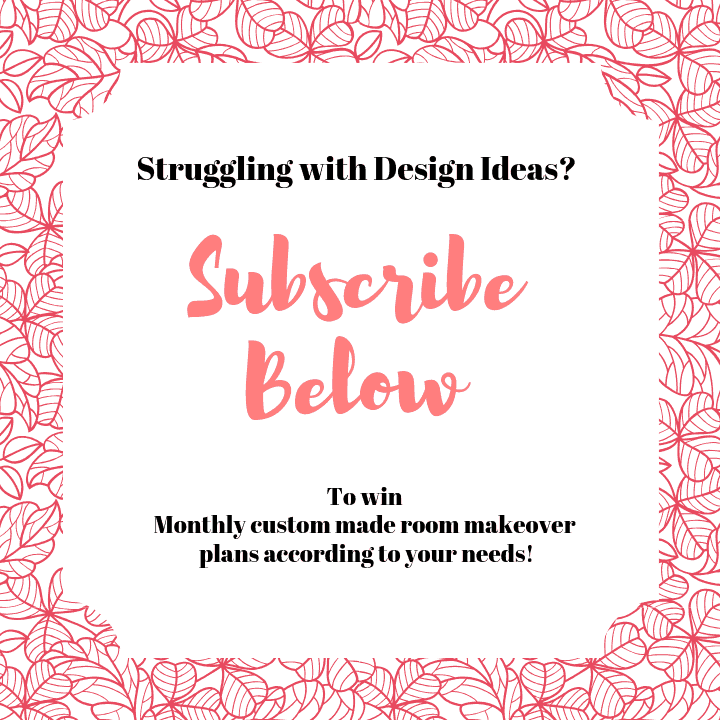 It’s always good to put a plan together for any room you are going to remodel or redecorate. 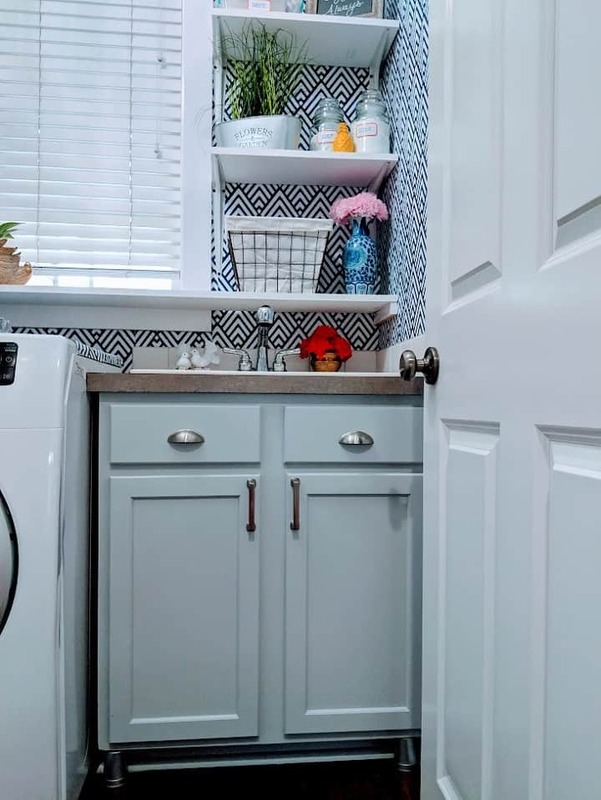 We did a small DIY remodeling for this small laundry room makeover. We would have never accomplished it without putting a plan together. Hence, always put a plan on paper for anything you plan to accomplish. Now, let me show you how I accomplished this simple plan I put together. How do you like it? You might see some variation in the light as I took pictures at a different time. Most of the pictures are un-edited, I wanted to show you the real deal. 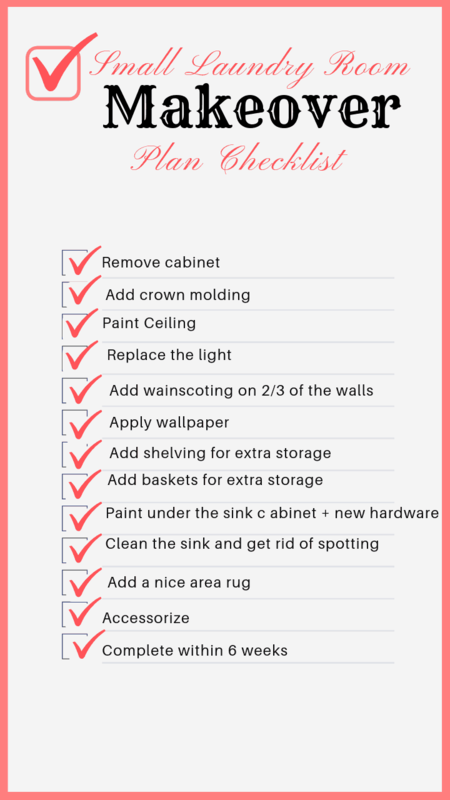 These steps will give you a clear idea of how to complete your plan of remodeling or redecorating. Stick with me, and you will be a pro within no time! 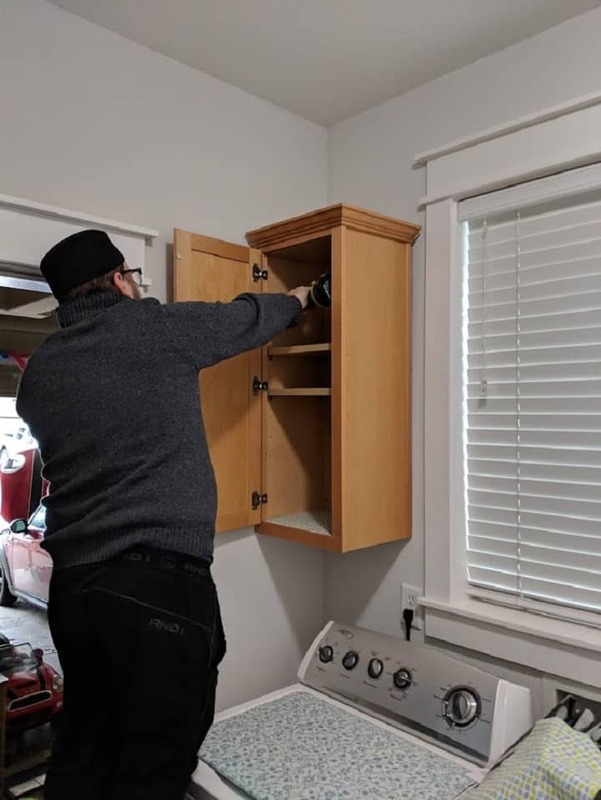 The first thing we did was to remove the ugly cabinet. Keep this designing rule in mind – that symmetry is very important when it comes to design concepts. So, as soon as we removed that stand-alone cabinet. 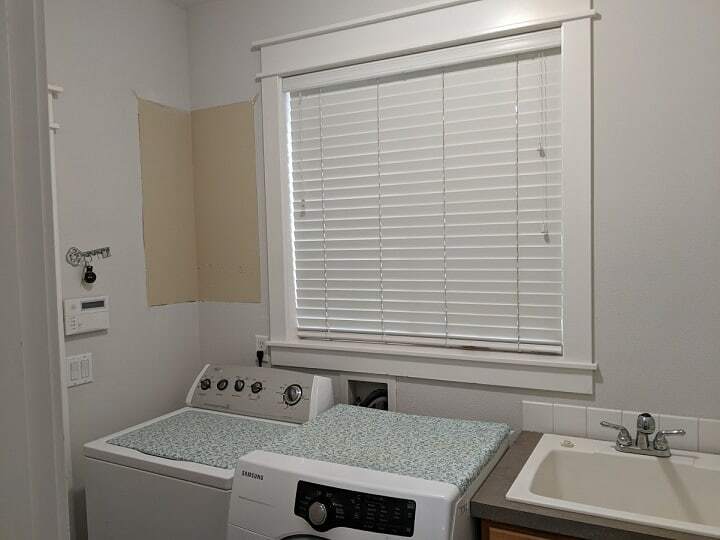 This small laundry room was already starting to look nice and was on its way of getting a great makeover. There is a lonely and sad cabinet. It was super easy to remove because there were only a few screws securing it to the wall. Have you noticed? It is already looking spacious. 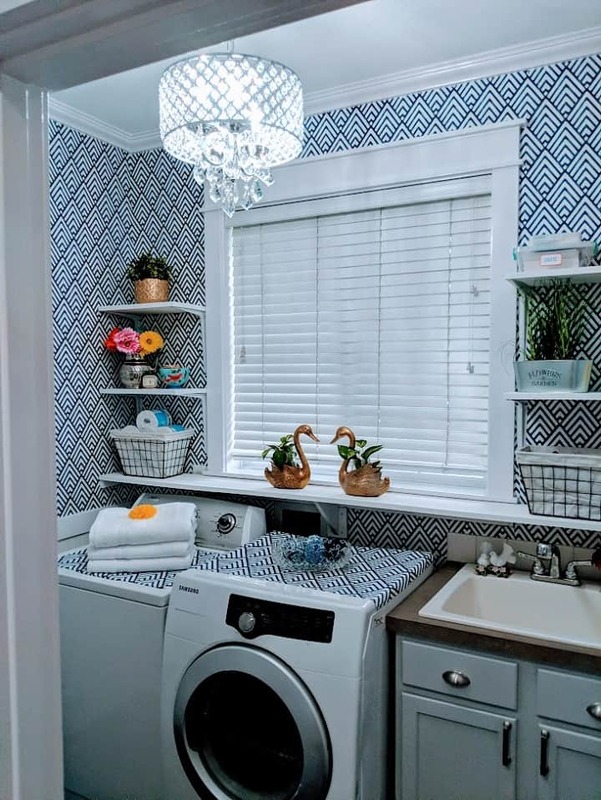 The laundry room doesn’t have to be a huge space but let’s face it, we all like pretty stuff. 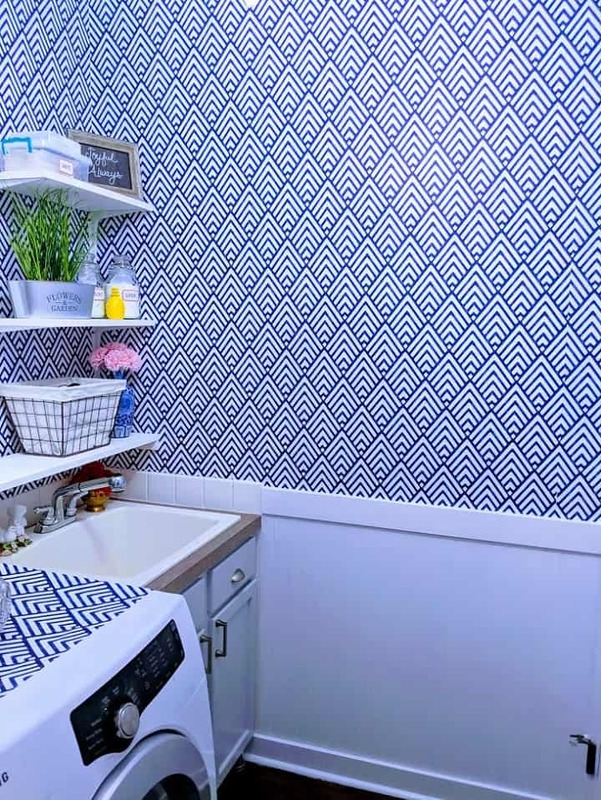 You are going to be surprised to see the after-makeover pictures for this small laundry room. The second thing in the plan was to paint and brighten up the room. 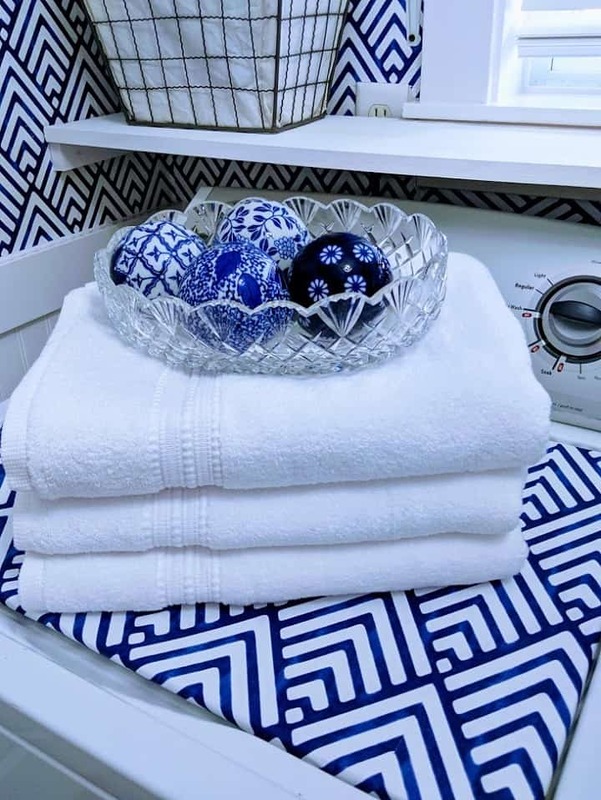 Here is another tip for you – not only for a small laundry room makeover. 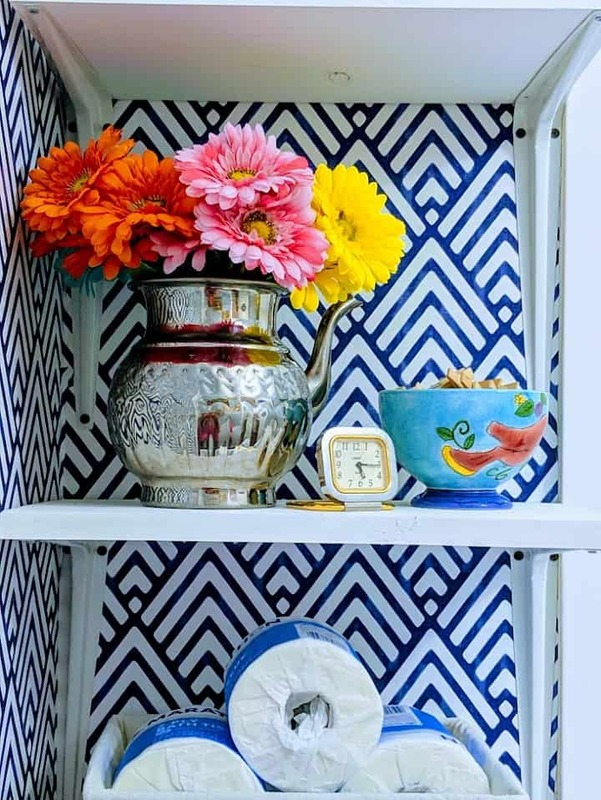 Perhaps, paint the most inexpensive way to brighten up any small room or space. A fresh paint of white coat on the ceiling made a huge difference. I then painted the cabinet under the sink, and oh boy, it just changed the vibes in the room! This is the vanity before without the paint. Did you notice that there was no cabinet on this side of the room above the vanity? Here is the picture after the paint. Doesn’t it look so farmhouse style! I showed you step-by-step instruction on how to paint, right here. After I painted the cabinet, my husband installed the hardware and it really made a huge difference. Not only did we add hardware, but also added feet. You are not going to believe what I used to make my feet for the vanity. Check out my previous post to for that. Use your cabinet to put all your laundry detergent, etc.. Nicely tuck them away out of sight. 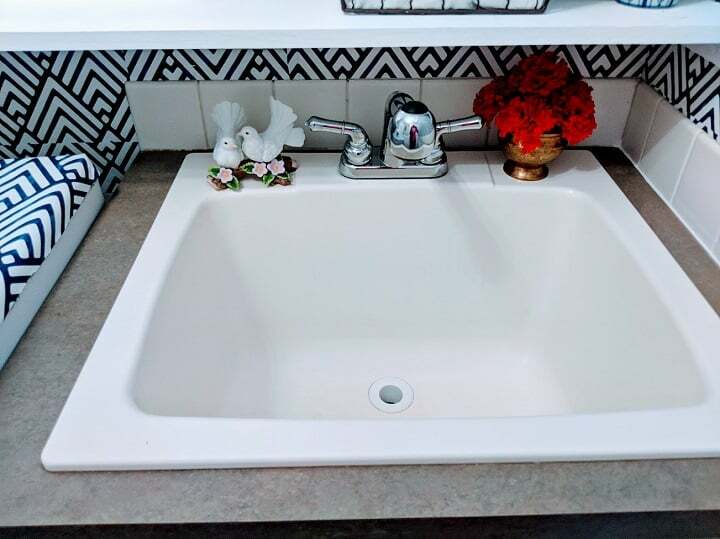 Spotless sink always looks great! Adding crown molding was the tricky part. It’s very technical when it comes to putting the corners together. My husband did a really great job. He put all the measurements on paper before he cut anything else. 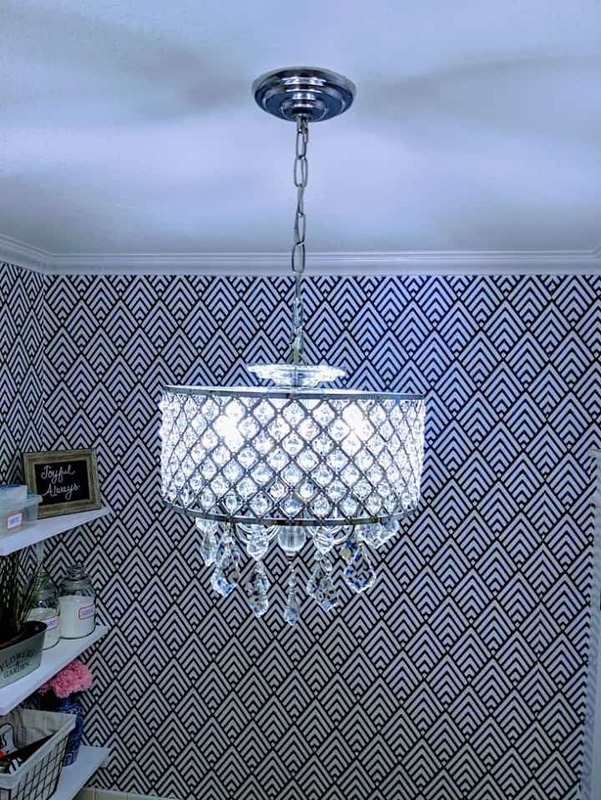 It does add a lot of charm in the room! We are planning to do that in our living room and a few other rooms. I will do a step by step tutorial on it for you later. Paint the ceiling before you add the crown molding. 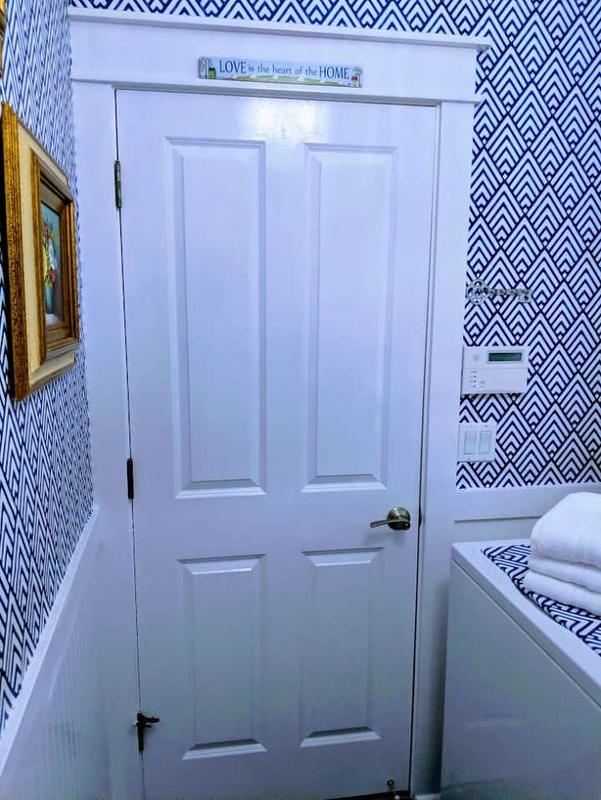 Otherwise, it’s a bit harder to paint if your color is going to be different than the crown molding. Our laundry room is not huge so the ceiling was pretty small as well. The total installation time was 2 hours or less. Here is the ceiling before. It does look boring and outdated with an outdated light. After the molding, we installed the chandelier. 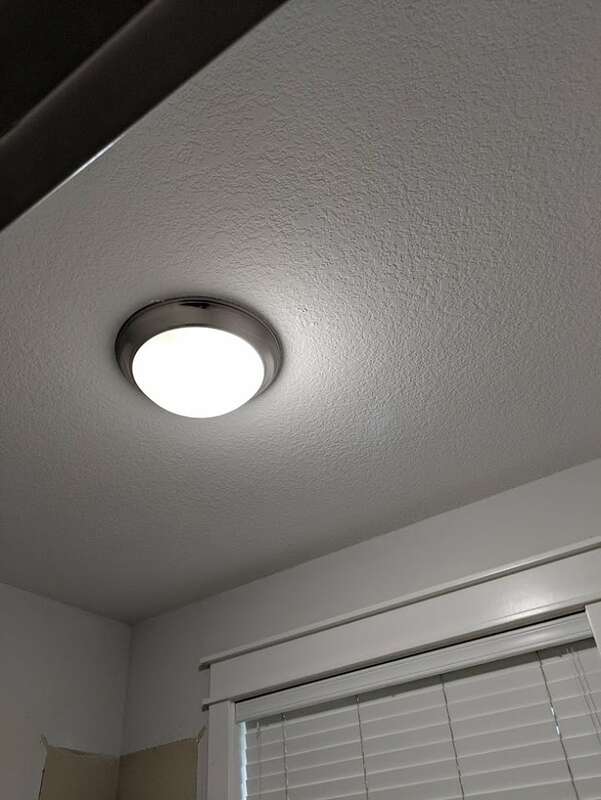 Well, I mean my husband installed it. I was just holding the ladder. Well, it still helps. I am glad I didn’t forget to take pictures of the light fixture to show you. It’s all “builder’s grade cheap stuff”. 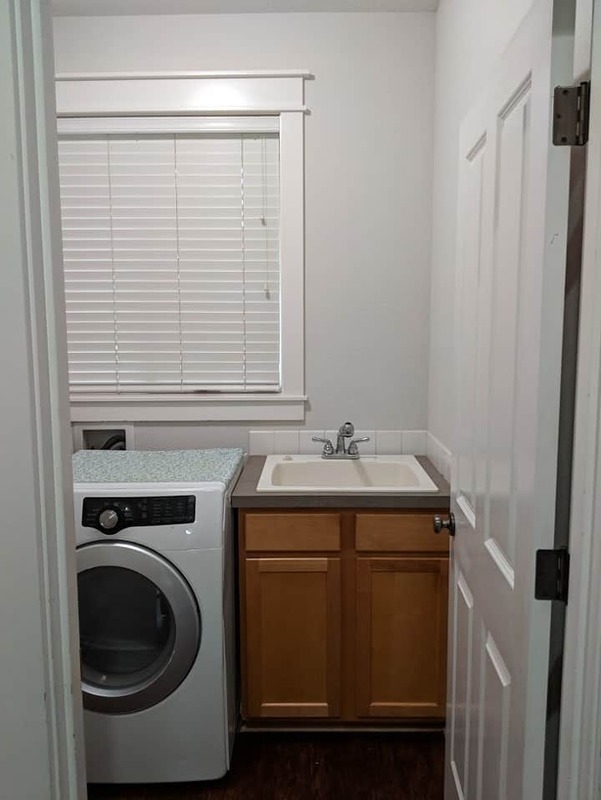 Honestly, it was depressing to come in this tiny room to do laundry. Please be safe when installing light fixtures, and ensure the power has been cut. It looks so pretty without spending a fortune on it. You also can see the crown molding on the wall as well. I have to admit it. Peel and stick wallpaper was a difficult task for me. But on the other hand, it adds so much to the room. It actually made the room look bigger than it’s actual size. I have done a whole tutorial for you on how to put up wallpaper. If you want your room look absolutely charming and would like to add extra character to it, then go for wainscotting. It really adds character to any basic architecture! Most builder’s homes lack all these characters in them, as they don’t really care for any special detail than they need to sell their homes. I love those charming homes full of character. In fact, I know I am not alone. All of us want our homes full of charm and have real character. But, more often when we make purchasing decisions it’s not solely based on charm but rather on a school distance, location, size, and the biggy is the budget. Our house is overall beautiful, but as I said, builder’s don’t pay attention to everything in pretty and aesthetic manners. 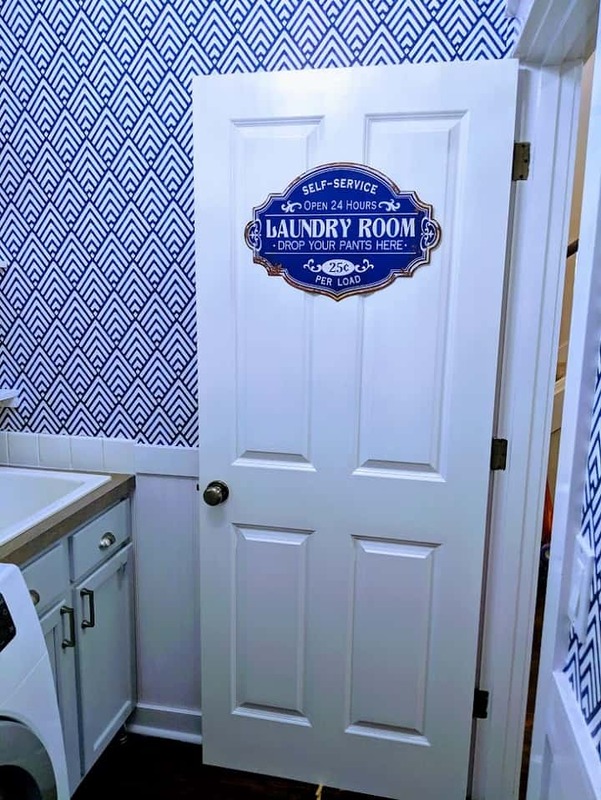 So, we decided to boost our small laundry room by adding the wainscoting. This is how it was before. Nothing to be excited about. That’s the after. Yes! A neatly dressed up wall. Here you go with the tutorial. After. It was a quick DIY to add shelving. The paint took more time than the installation. 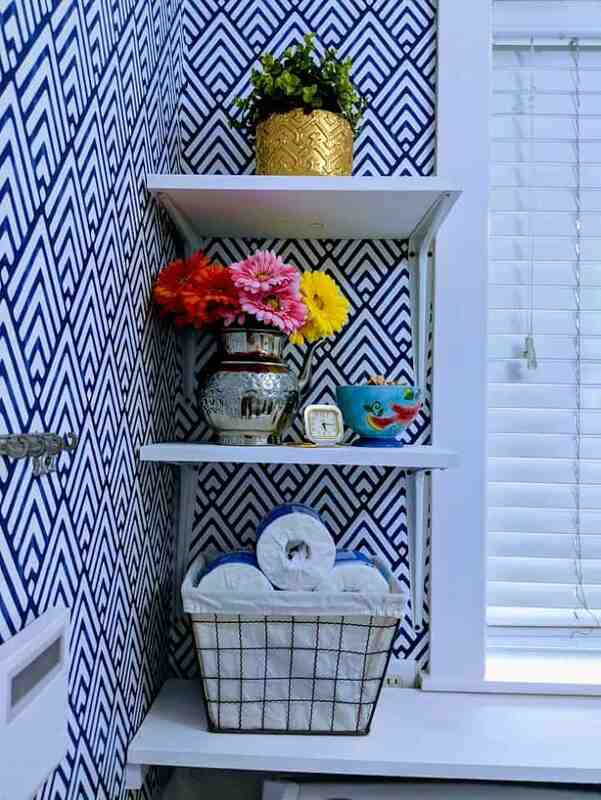 Baskets are a pretty way to add storage anywhere in the house. Our guest bathroom downstairs has no storage, so I do need to store some extra toilet paper and cleaning supplies in the laundry room for the bathroom. One of the basket house all our toilet paper and the other one I placed all the random nicks and knacks. 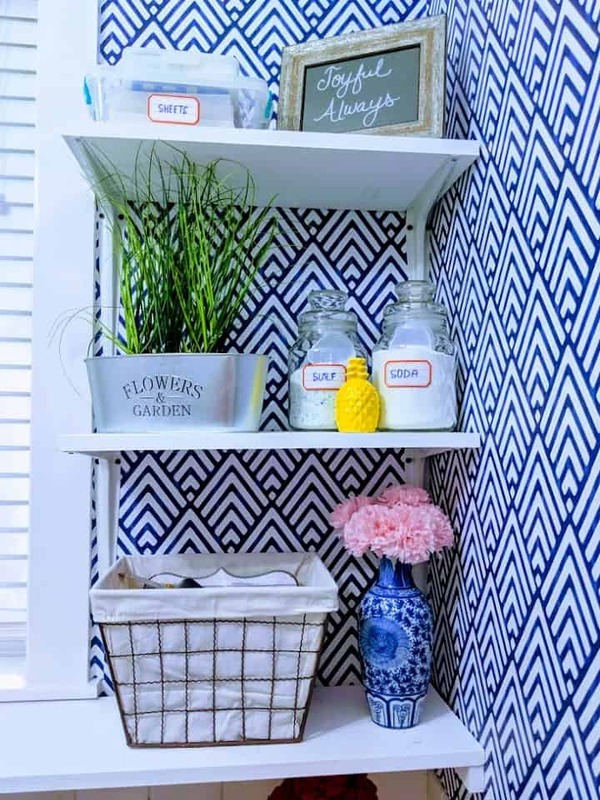 Baskets don’t just look pretty but are also very functional and one of the best inexpensive storage solutions for any room in the house. Who doesn’t love to accessorize? I am not exceptional either. When it comes to accessory shopping, I mostly go for budget decor. There are a lot of great stores are out there to shop, such as Ross, Home Goods, or even Amazon. Having an Amazon Prime membership really helps you to save because of the free shipping and two-day delivery. Some times you can score nice antiquish decor while garage sailing or thrifting. Don’t be embarrassed by it at all. 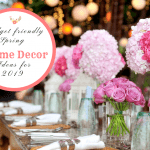 If you are anything like me, you love to change your decor quick so it’s not a bad idea to shop within your budget. Sometimes I just swap things form different rooms. An example is the blue vase below. I brought it from the living room. Man, blue is my new favorite! Everything is so easily accessible. The top pot is from the thrift store and all I did wash it to make it look fresh again. I love anything brass. 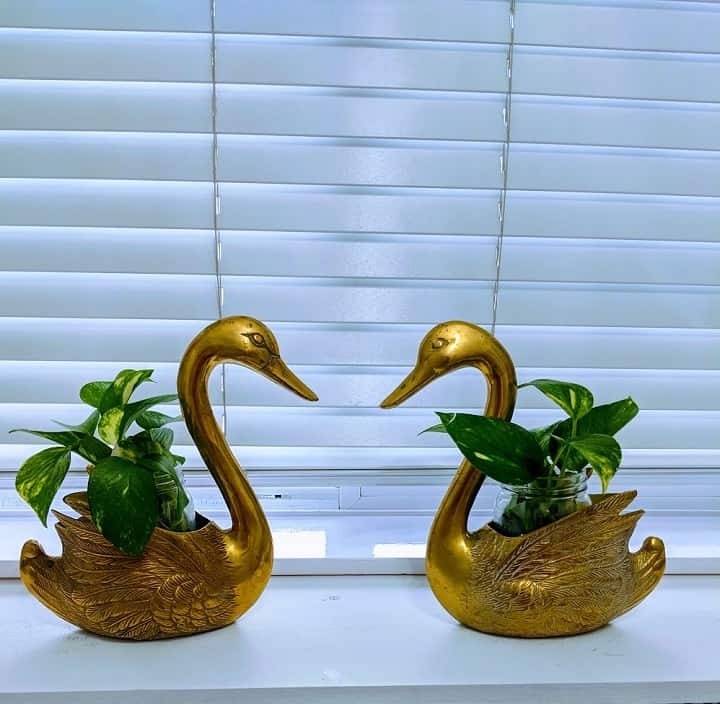 These two swans look like I purchased a pair, right? Nope, 1 was found one while garage sailing, and the other one I happened to find in a thrift store. They are nicely holding my pathos (the only plant, I seem to keep alive). I used a really great brass cleaning product to clean them from Amazon. I will put the link below under the resources area. A touch of yellow is so pretty! 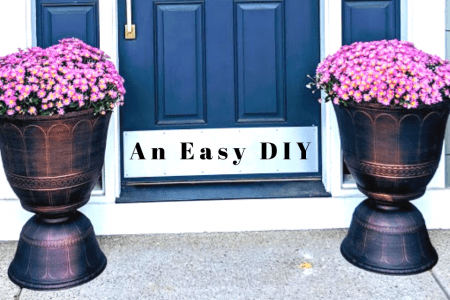 I am totally in love with these flower and garden pots from Dollar Tree. The grass plant is from a thrift store for a couple of dollars. The pair of jars holding baking soda, and laundry detergent are also from a thrift store for only $2. I added a touch of yellow by putting this Dollar Tree pineapple in between those two. Don’t you just love it? I just love those flowers. Looks so springy. That little bowl holding clothes pin next to the little clock is a garage sale find that was 50 cents. My mother likes birds on everything (“Put A Bird On It”), and I purchased for her room a few years ago. My mother bought the silver pot about 13 years ago. What do you think about my little rug? 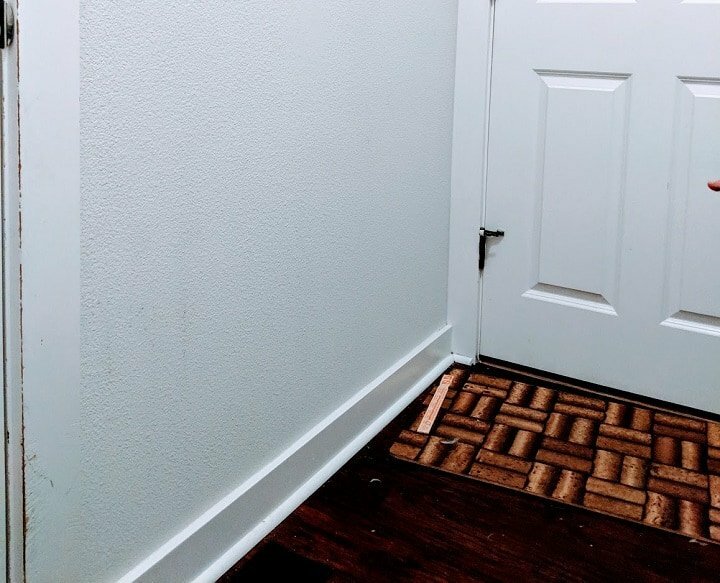 The rug is in fact, made out of two bath mats, and matches with our color scheme of blue and gray with some pop of colors. 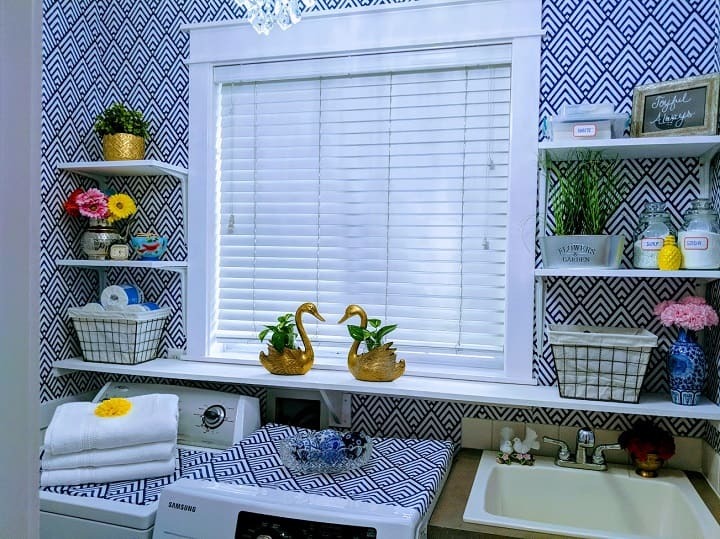 I had purchased these bath rugs from Kohls on sale but decided to use them in the laundry room. They are really fuzzy. The small laundry hamper is a thrift store find. 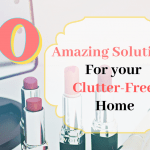 You can make any room beautiful without breaking the bank. The best thing to do is when you put your plan together, and I always say this, work with your budget. 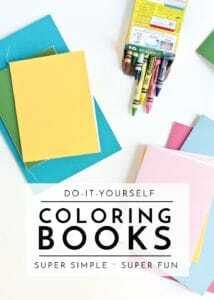 Don’t just copy things on Pinterest and break the bank. Work with what you have. 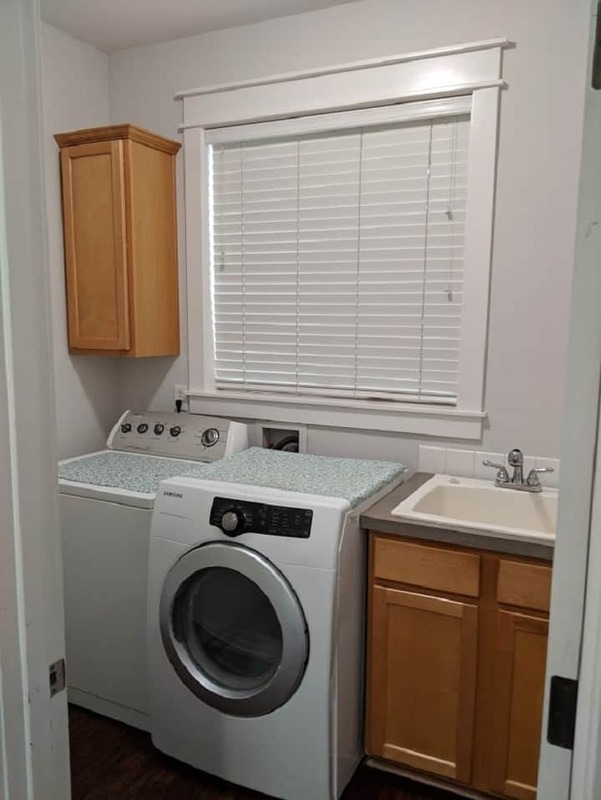 We wanted to change our washer and dryer so bad, and in the ideal world, I would have done it. My mother wanted to give me a set as a present, and it was $3000. It’s a lot of money guys. 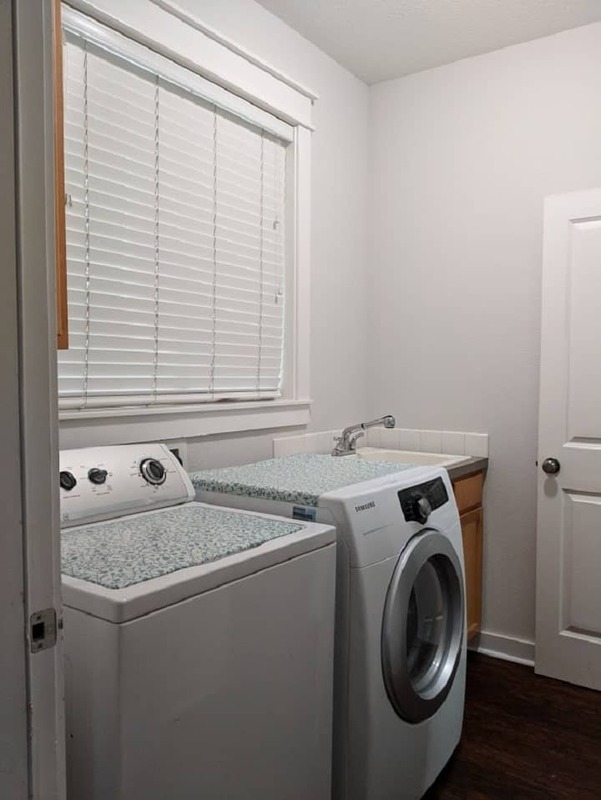 I figured that both the current washer and dryer work just fine, so what’s the fuss about. We focused more on the functional side of the room and added some cosmetics to make it look pretty as well. $2 Accessories (on the flower and garden pot and a yellow pineapple) rest was all what I already had on hand. I really love how it turned out! Although this room is just pass-through from the garage into the house, I admire walking through it. Hunted around the whole house to find all kinds of blue! We have not added the Mirror as I preferred to show more of the wallpaper. 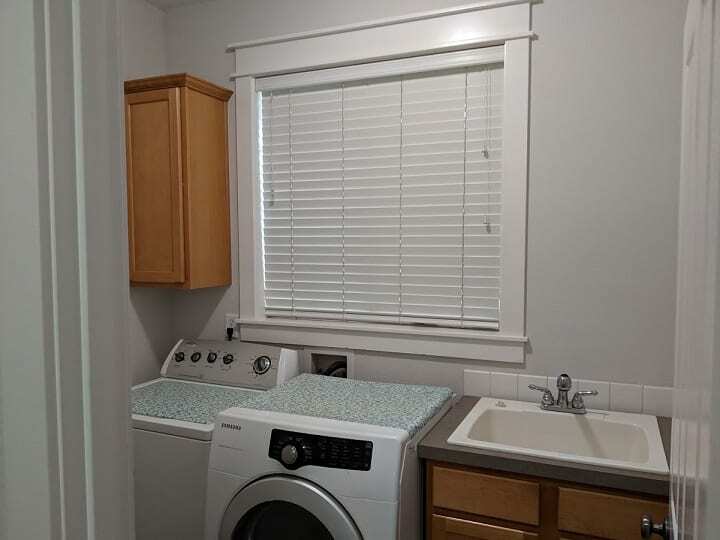 Kept the same Washer and dryer and I talked above how I wanted to stay on a small budget. 6 weeks was the total time I spent on this project. If you work full time and have children, then don’t rush yourself. Just work slowly. 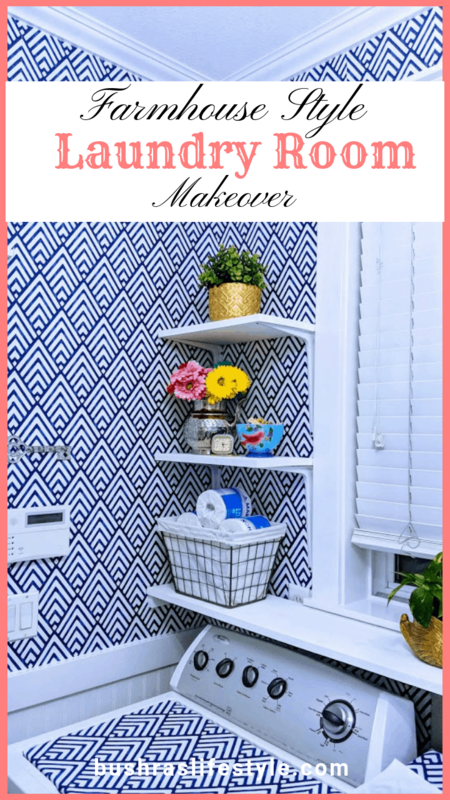 The reason it took me a bit longer was that I was showing you all the steps for this makeover. 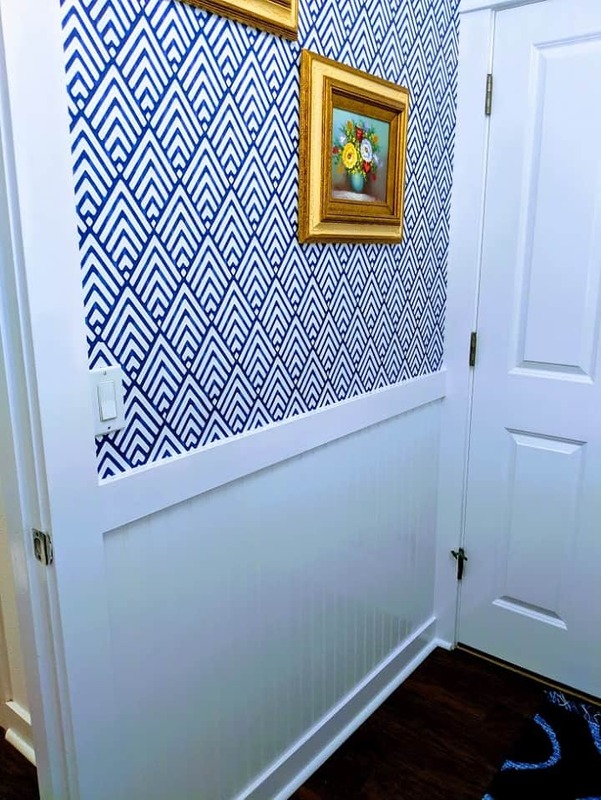 I did the tutorial on Paint, Wainscoting, and wallpaper. 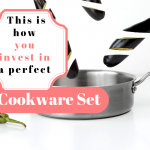 Now you have all the resources ready for you. 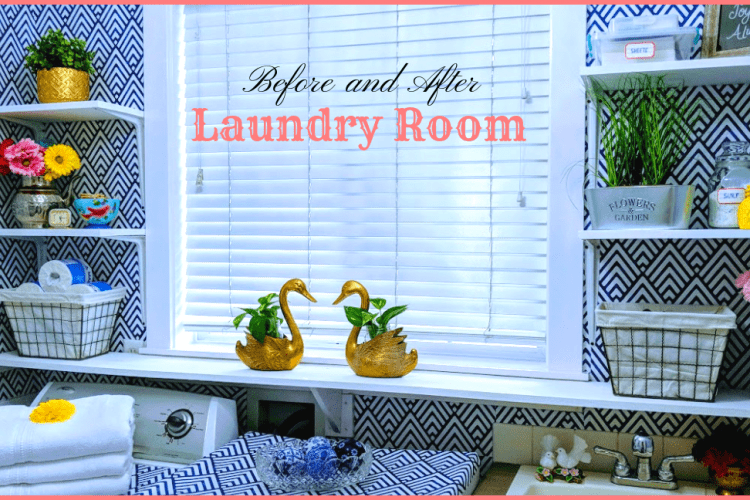 With some love, you can give your small laundry room a great makeover and turn it into a place where fluffing and folding is fun…The room makes me smile every time I pass by. A little effort went a really long way! 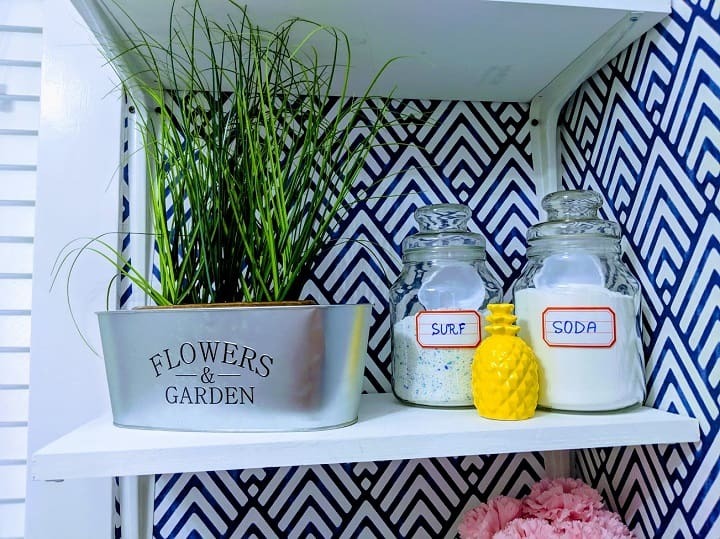 Here Is The Resource List For You, To Make Your Laundry Room Pretty! Thank you so much Carolyn! Yes, I thought these swans are totally show stoppers! Pinterest, FB , IG worthy. You did an excellent job. How much was the chandelier? Thank You Lafayne, the chandelier was a present for my mother. I love it! And no – I have never re-done a room. My husband is very anti-DIY. Maybe because my family has told him how horribly wrong my projects go. Like spilling a gallon of paint on the carpet bad. But this lets me dream. I am sure you would do a great job. That would have been an accident, I bet you didn’t want to spill the whole gallon. Thank you! Hahahaha, thank you Sarah! Yes, I feel the same now…it feels very peaceful little corner in the house. How fun! I’m stealing your word – garage sailing (sailing through my neighbors’ treasures) 🙂 Love it. 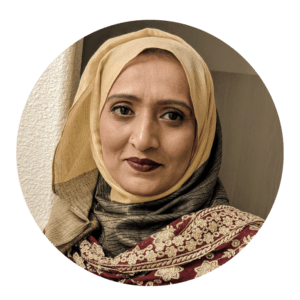 Bushra, this is such an amazing transformation! How proud you and your hubby must be of all your hard work! 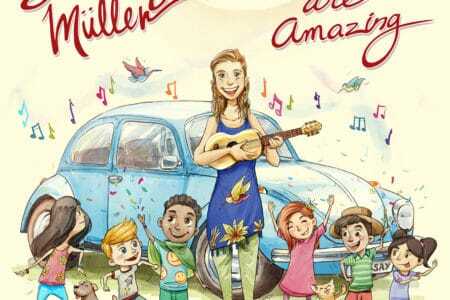 The room is brighter and much more happy than what you had before. Doing laundry must be a much nicer experience now 😉. And all this work for under $500?! Wow! Thank you Erica! Yes, we are really happy to see the after results! 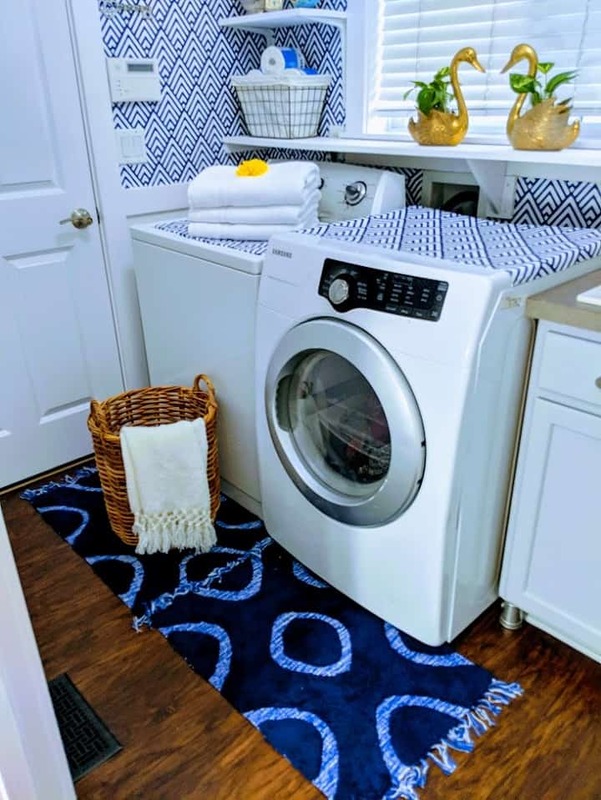 Wow..what an incredible job with the laundry room and the blog post. It looks amazing. I love the white, open shelves and all the little details there. Love the swans. Even after I read they didn’t come as a pair I couldn’t tell. The yellow colour is also such a nice touch. Well done my friend! Thank you, Devinder for being such a wonderful reader! I agree, shelving really opened up the area. Wow, what a huge difference between the before and after. The room looks great! Really love the colors you picked. You guys did an amazing job of doing all of the work and keeping the budget low. 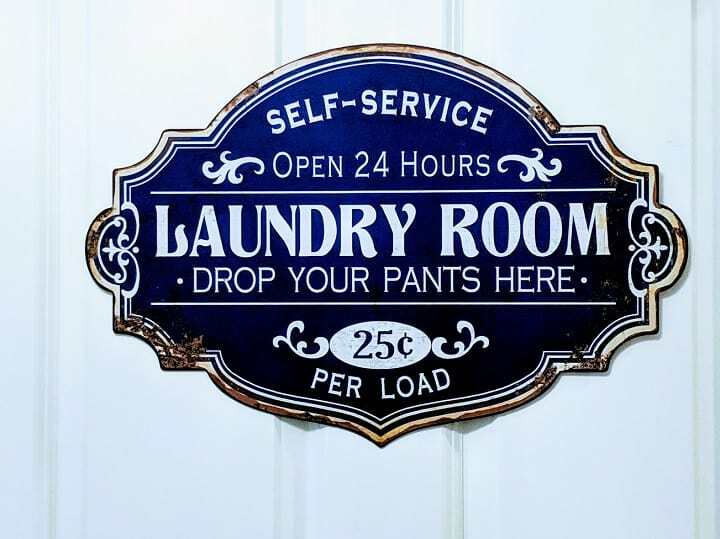 I would love to have a laundry room that looks like that. Thank you so much, Sarah! Please don’t forget to subscribe as I am going to start a series on “Design tips tricks” soon. 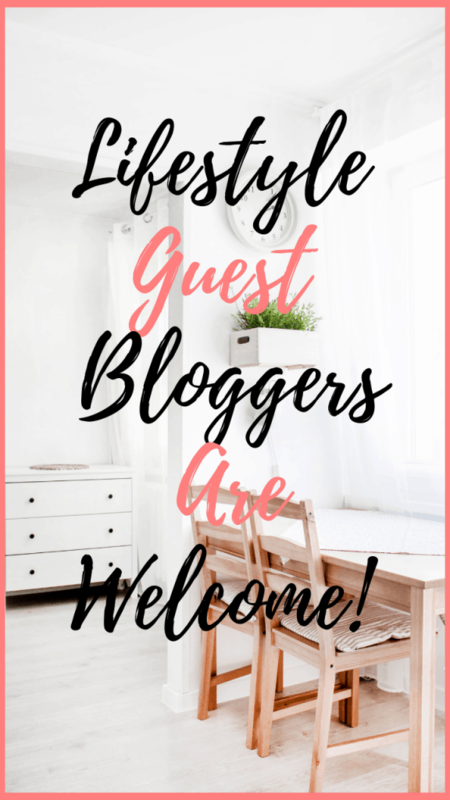 Welcome to Bushra’s Lifestyle’s family!.